Eighteen year old Aaron Squirrel's myspace page lists as his influences: "Eric Johnson and anything else." I was quite pleasantly surprised to hear the EJ influence goes well beyond a few choice Cliffs of Dover licks jammed sideways into a typical shred demo. The www.aaronsquirrel.com home page features great tunes, and you'll also get to check out more at his myspace. The Oklahoma native is of partial Loyal Shawnee descent, which helps to explain his last name. Squirrel has opened local shows for the likes of Eric Johnson and Johnny A., and is already an established staple in his regional blues & music festivals. 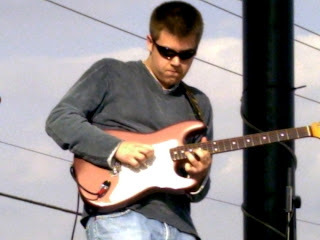 Aaron Squirrel is a very tasteful guitar player with a big sound, so check him out!